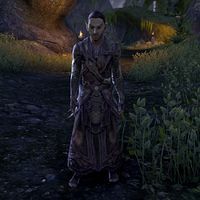 Mathragor is a Bosmer found in the village located in the Bloodtoil Valley. He is the father of Dalaneth, and his fellow denizens are among the last Bosmer worshipers of Z'en, being at odds with the Drublog Clan. "I'm not surprised you ask. Few worship Z'en these days, though his shrines once spanned the whole of the Valenwood. He is the god of toil, and payment in kind. Fitting we make the Wood Orcs pay for their actions!" Why aren't there more shrines to Z'en? "The Knahaten flu decimated his faithful. They say Argonian Shadowscales infiltrated our worshippers and spread the flu, curse them! We are the last of Z'en's followers. If we fall to the Drublog, none will be left to keep the old ways." "Z'en answers my prayers! The Drublog will finally pay!" "The Emissary of Z'en! My prayers are answered! She'll strike down the Drublog and end all of this!" "Z'en would abandon me in my time of need? After all this, he gives me nothing?" I can't let this bloodshed continue. "They've slaughtered my family and laid waste to my home! They will answer for their crimes! If Z'en won't help me, I will find another that will give me justice!" The Drublog have suffered losses as well. It's up to you to end this. "I will not! They must all pay. Do you hear me? They must pay with their lives! I'll suffer no Drublog on these lands as long as I draw breath!" [Persuade] Your daughter gave everything to bring an end to this. Don't let her sacrifice be in vain. "Dalaneth! If I could see you once more, I would know what to do! She would weep if she saw me now. She only knew kindness and love. Why did I survive while she died? You're right. I must find the balance again." Is this how you serve Z'en? By defying him? "You're right. You've been right about everything. These horrific events must pay forward to a better future. If not for my daughter, then for all the daughters and sons of others like me." "First, I will find my daughter. Hold her one last time, and try to remember the lessons she taught me. Then... I must rebuild. Perhaps I will find the concept of balance once again. If that is to be my burden, I carry it gladly." "You've saved me. Saved me from myself. And in some way, you've saved my daughter too. I feel her love again, like a balm upon my heart. There's nothing in this world that could repay you in kind. I will pray for you for the rest of my days." "One must discard what makes the scales tip. This is the truth of Z'en. <<1>> no longer wished for balance. Thus, he was no longer a follower of Z'en.\n\nFarewell, mortal. Z'en has turned his back from this world. Until the scales tip once again." This page was last modified on 25 August 2018, at 08:22.